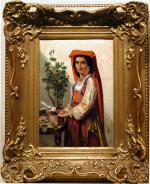 Very nice genre scene with an Italian girl in folk costume by listed Dutch painter Sipke Kool (1836-1902). He was a pupil of C.Bisschop and later worked in Italy where created numerous Italian genre scenes. Kool´s paintings are exhibited at the City Museum of The Haague. In 1882 his paintings were exhibited at the First International Exhibition in the Vienna Artists Unit. The artist is listed in the General Dictionary of Artists from Antiquity to the Present by Thieme/Becker, Leipzig, 1999.